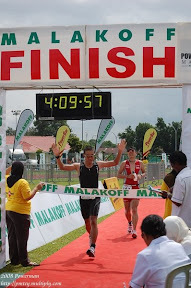 6th May 2012, Kota Kinabalu Sabah – One purposed, to make a personal best for 42km run. My previous record for 42km was 5:09 set in 2010 same place same route. At that time, the target was just only to finish the run and have fun. This time, the run was to set a new time. I set 3 targets which is sub 5 hours, 4:40 and 4:30. I set my Garmin virtual partner to a 4:40 time and hopefully I can maintain my pace at 6:41 or faster. I know I can do sub 5 hours because I’ve done my training (is it enough?) and hopefully my leg won’t fail on me. One thing I really don’t like was the starting time. It was way too early. The reason was to avoid the heat. Kalau takut panas, buat night run or midnight run kah and change the name to Borneo Marathon Midnight Run. I think those who complaint about the heat are those don’t like running in the heat . If takut panas, go and join Singapore Sundown Marathon, Energizer Night Run, Putrajaya Night Run, Penang Bridge Marathon and etc. All those run are good for people who love to run without the Sun’s heat in their face. The race started as scheduled – 3:00am. It is still the same route as previous years but now they reversed the route by which when the sun come up, the sun will be behind our back – good for those slow runners like us lah. From the 1st km up until the 25th km, my pace was above the target pace of 6:41min/km. After that my pace slowed down and right until the 32nd km, my virtual partner managed to catch me and from that on I know to get 4:40 finish would be very difficult. So for now, the target is not to go over 5 hours. My pace was between 7:00 to 8:30min/km. As painful as it is, I managed to finish the run in 4:58:28. I think my pace become slow was because I don’t have enough endurance to run the 42km run. I need to do more longer run. I have 2 very BIG run coming up which is the 100km Trail Ultramarathon (September) and the Penang Bridge Marathon (November). The official results. Brunei runners 1st, 7th, 9th (i think), 16th, 21st, 29th and 32nd. The rest of the runners, I’m not really sure. My virtual partner was infront of me by 1.7km i.e. he finishes around 10:40 minutes earlier than me. I ate 4 Powerbar Gel Tangerine and 1 GU ultra endurance gel and 1 banana. Next time, I should bring also some cash money to top up my energy level. Congrats on the PB! I've just started training to run 3 months back and stumble across this site. I think you guys are inspirational. Met you once at the Mentiri highway Sunday morning (I'm the guy with the hydrapak) and i know jai, a senior in college (hi jai!). Keep it up with your goals guys! hopefully i can join you guys nanti. I am definitely keen on that 100k Ultra and also thinking of picking up the bike and swim someday. Probably next year Insyaallah. Keep the interesting posts coming please.